WAIT! Before I get started I'm going to forewarn that I didn't have time to edit the pics (or size properly) and given that it's nearly 9pm on Sunday... well... it's just not happening folks. Also, given the time and my level of fatigue... this is going to be short and sweet. Sick day - yes, I know, you're wondering how on earth this is a good thing and truthfully, it's not. I was so so so sick on Monday. I haven't felt that terrible in a long time. Like an idiot, I drove nearly an hour to work and when I got there I thought to myself "what are you DOING?". I had a quick chat with my supervisor, packed myself up and went home. I fought EVERY urge I had when I got home to clean the house or do errands and I literally laid on the couch ALL day. ALL day. I needed it. Anything else would have resulted in my being sick a LOT longer. Sometimes, you really just need to listen to that little voice saying "take care of you". Also, I finished "Nashville" so basically I got my life back lol. Girl's day and figuring stuff out - so the day after my sick day, I had half the day off because little miss had a specialist appointment. We ended up having a great breakfast out together and did a few fun things. She has had a few issues with sickness, coughing, breathing etc. so we finally got a diagnosis of asthma. I was shocked at first but not nearly as shocked as I have been with how well she has been taking her twice a day puffers. Seriously, this kid is a rockstar. Don't get me wrong, I'm not happy she has asthma, but I'm glad to know, to have a plan and to know where we go from here. I'm also so impressed with this kid who exceeds my expectations daily. not THAT is a breakfast!!! practicing taking her medicine... she now presses it herself and takes her big 6 deep breaths with very little help. Wellness time - Wednesday I attended a big meeting for work. Part of the meeting involved picking an activity to help foster resilience/wellness so my coworker and I decided to take a walk by the lake. I'm a little upset with myself I didn't take some pics of the scenery but it was an absolutely beautiful setting and I got to catch up with one of my work besties. Stella & Dot stuff - yes, I work full time and yes, I decided to become a stylist with Stella & Dot which kind of seems like crazy making because I can't keep up with blogland... but here's the thing: it's fun for me. I've enjoyed the parties I've thrown/attended and I went to a training this past weekend a it literally just felt like girl-time with pretty things. Plus, I've been building a pretty solid accessory collection lol. Running for a cure - a while back I signed up for the CIBC run for the cure. I had hoped to raise 1000 for breast cancer but didn't quite make it. I came in at 487, which just gives me more to work towards next year. For those who don't know, I lose a friend, Nicole, this past year to metastatic breast cancer and I signed up for her. It was so much more emotional than I imagined, I cried almost as soon as I got there and I was so very thankful my friend decided to come with me for support (I didn't realize I'd need it - hindsight, I DEFINITELY needed it!). I was grateful to see all the survivors but my heart was heavy that Nicole wasn't one of them. I also got to see her mom and husband, who also came out to support a cause so very close to their hearts. At the end of the day I'm grateful to be able to be here to raise funds and awareness about breast cancer. I was not in the shape I should have been, but I finished, with tears in my eyes and a "for Nicole" sticker on my back. AND a big fat special THANK YOU to my sweet blogger friends who supported me from afar - you ladies ROCK! Have a beautiful week friends!! I'll actually be back on Wednesday this week posting a fall fashion post!! lookout! 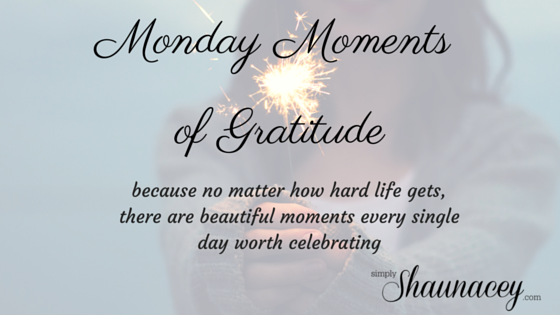 What moments are you grateful for this past week? Linkup your posts below! !